Spiced Apple Butter is excellent with scones or biscuits but can also be used in oatmeal or on pork chops…or just eat it with a spoon! I love all the delicious apples that are available right now, so when I came across this recipe for Slow Cooker Spiced Apple Butter I decided to give it a try. 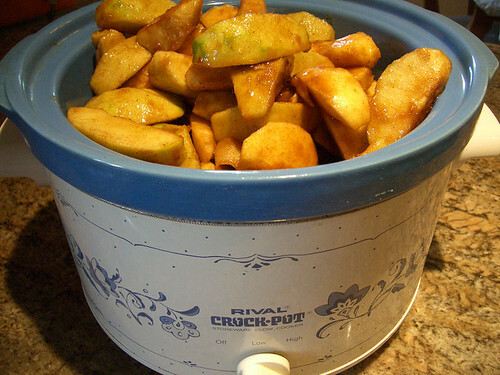 The fresh apples, sugars and spices are slowly cooked over a 14 hour period in a crock pot. This slow, low cooking results in an apple butter that has a rich, delicious spicy apple flavor that would be perfect as a gift for the host of your holiday gathering. If you have a slow cooker at home, this is the time to bring it out and give this apple butter a try. Here is how you can make your own. You can find the basic recipe here. Start by peeling, coring and slicing 6 1/2 pounds of apples. I used a combo of tart Granny Smith and sweet Fuji apples. The recipe calls for peeling the apples but if you like a little more texture in your apple butter, you can certainly leave the peels on. Set the sliced apples aside. In a medium bowl whisk together the sugars (I used dark brown sugar instead of light brown sugar), cinnamon, nutmeg, cloves and salt. I added a pinch of mace and less that 1/4 teaspoon of cardamom for a little extra spice. Set aside. Place all the sliced apples into the slow cooker and mix in the sugar/spice mixture until all the apples are coated. Place the lid on the slow cooker and turn to low heat. Let cook for 12 hours. Remove the lid, add vanilla extract stirring well. Leave lid off and cook for another 2 hours. After 2 hours, puree the apple mixture with an immersion blender, or you can do what I did and just puree in a blender. At this point you can jar the apple butter or return to the slow cooker for another hour or two to make a thicker apple butter. Place finished apple butter in jars. This will keep in the fridge for two weeks or in the freezer for a month.